EZchip had a booth at the Nov 17, 2015 White box strategies for CSPs show in Santa Clara. 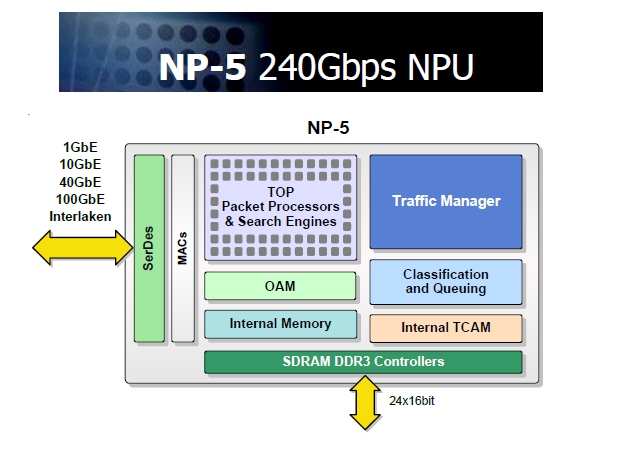 Their NP-5 is a network switch SoC that uses external memory as its packet buffer. This sets it apart from e.g. Trident and Tomahawk from Broadband. As an external memory device, it can have very generous packet buffers and therefore very deep queues. The NP-5 was announced in a 2011 press release. The announcement of volume shipments was made on December 22, 2014. Based on claimed shipments in regulatory filings, it is clear that someone was buying the NPUs. Who is someone harder to discern. Wisdom on the street is that Cisco uses the NP-5 as a line card switching element on ASR9000 line cards. More information about EZchip is available on the SiliconInvestor web page. EZchip is a publicly traded Isreali company that is seriously considering selling itself to Mellanox. Mellanox is also an Isreal-based company. Mellanox makes switch chips with internal buffer memory, so this merger is understandable. n.b. this is the wrong web page to get financial analysis. 19 January: The acquisition by Mellanox will close in February. Selling price was $25.25 per share.